You all know my love of Ashley Stewart and I’m so happy to have just gotten a hold of their new spring images. Not only are the clothes beautiful but the models are so gorgeous too. Familiar faces such as Anansa Sims, Nicole Zepeda and Anita Marshall serve up curvy fierceness in the new campaign. Fashion knows no size or shape. It’s all about personal style and self-confidence. That’s why buyers for the Ashley Stewart line of plus-sized clothing have translated this spring’s sleek runway fashion trends into stylish looks for women with curves. 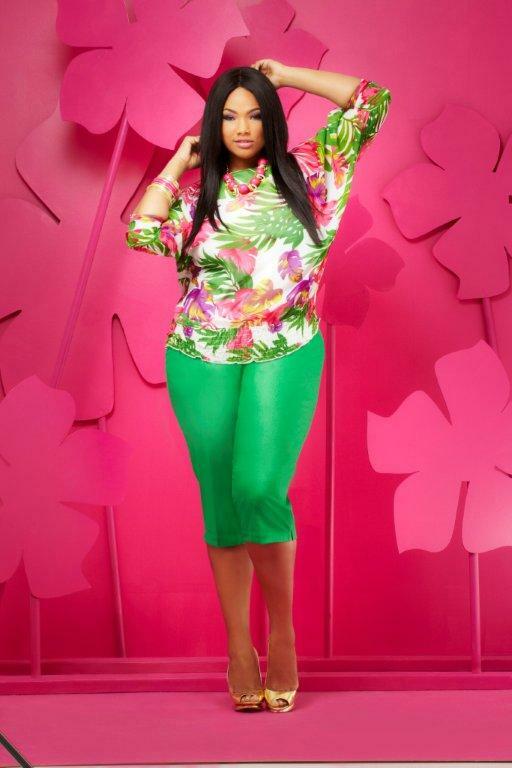 The spring plus-sized line from Ashley Stewart features eye-popping prints, sassy stripes, graphic patterns, classic black and white, and denim that can be dressed up or dressed down. The spring lineup from Ashley Stewart includes bold prints and patterns, layers of mixed fabrics, and glam – lots of glam. The brand continues to stay true to its heritage as a retailer that offers customers head to toe outfits. Cropped cardigans and statement blazers top off bare shoulder styles. Maxi dresses that easily adapt for different occasions are the “must have” item for every curvy girl’s wardrobe. Add linen looks as well as classic and fashion denim in the season’s hottest colors to provide a well-rounded wardrobe. With a nod to major social events such as Easter and Mother’s Day and seasonal White Parties, the new collection offers a variety of choices to transition seamlessly between multiple activities, day or night. I just went on Ashley Stewart’s web sit and didn’t find any of the spring line on there site. How do you get any of this stuff? Why is it when you see something in a magazine or on someone web page, you can never find it on the stores web site or in the store? As I stated in the blog I got a hold of the images first as a blogger. Retailers often send us the press releases and first glimpse to share with our readers of upcoming collections. It should be online and in stores in the coming weeks for sure.